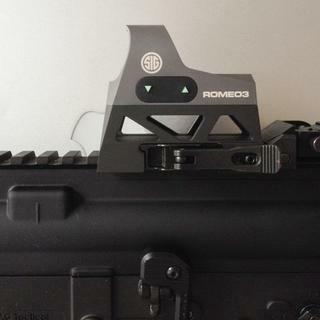 The Sig Sauer Romeo3 Reflex Sight is a versatile sighting option ideal for multiple firearm platforms including MSR rifles, shotguns, carbines, submachine guns, and full-size handguns. Featuring a 3 MOA red dot reticle with Sig's proprietary red-notch coating for guaranteed brightness, the ROMEO3 is perfect for moments that require quick target acquisition and accuracy. A side-loading battery makes replacement fast and painless without having to remove the sight from your firearm, delivering a level of assurance and sense of security. For additional dependability, the Romeo3 is IPX-7 rated waterproof and fog-proof. This particular model comes with an M1913 Picatinny high-rise QD (Quick Detatch) mount with a 001.41" co-witness. Does this come with the flush rail mount as well? BEST ANSWER: Mine did not, only the mount that aligns with standard height iron sights. 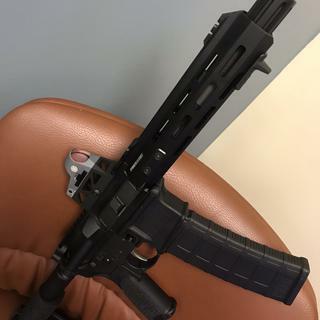 Would this be a good fit for an AR platform? BEST ANSWER: Yes it comes with a great qd high rise mount that cowitnesses with AR iron sights. It has beautiful glass and a nice window size. What's the difference between SOR31099 and SOR31002? Which is the latest? BEST ANSWER: SOR31002 is the version in the retail box with all mounts, and of course not on sale anywhere. SOR31099 is the OEM version shown above that just comes loose in a parts bag, with no low mount. Good luck trying to find a low mount. Even Sig won't sell you one... At least as far as I've been able to find in my research. There are other mounts it will for on but overhangs the mount on the front. I went to the Sig website and SOR31002 is the only part listed for the Romeo 3. Doing a site search doesn't even turn up the SOR31099, though I see both listed on other sites as well. I'd love a real answer to the question. Does this have the same footprint as the RMR? BEST ANSWER: No. This is a Medium size optic that uses the same mounting footprint as the Cmore RTS2 or the Vortex Razor, but is a bit longer front and back then either of those other models. Will this fit a Sig Sauer p320 compact 9mm ? BEST ANSWER: Please see above answer that I posted. 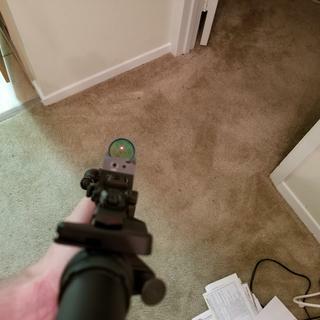 After looking at the P320 that my buddy has and my Romeo 3 there is physically no sensible way to mount that optic to the slide without going with a rear sight dovetail mount which will overhang the back of the slide and you will lose your rear sight by installing the mount. In terms of milling it into the slide, maybe once again if you completely milled the slide from the breech face all the way back removing the rear sight dovetail in the process. The Romeo 3 is really too large in general dimensions (60mm front to back) and weight to be using for slide mounting. Sig installs the Romeo 1 on their P320rx, if you are wanting to slide mount a sig brand optic that is the one I would suggest as it is 45mm from to back. Is it a good sight for range targeting up to 500 meters ? BEST ANSWER: Past 100 meters I would want a regular rifle scope with good magnification. Not unless you have 20/20 eyesight. Close distance only I would only do up to 25 meters. Does it come with any type of protective cover for when it is not in active use? BEST ANSWER: Yes, it comes with a huge cement brick and a bungee cord you can install over the sight system. Optional carabiner & lanyard makes carrying it along with you easy. ;) wondering if PSA reads these, seems they don't have time to answer regular inquiries. Yes it does come with a cover. However, be aware that the one on sale does not come with a low mount. As mentioned by other customers, you cannot find a low mount, even Sig will not sell you one. Sig, in my book, really failed for not selling any low mount. Yes, it comes with a thin, but reasonably durable rubber cover. It's perfect for storage and transport, but it could easily get knocked off eventually if you're doing something active, like running through the woods. Yes it comes with a thick, but flexible rubber form fit cover for the optic. Yes, the Romeo3 has a soft, fitted cover to protect it when not in use. Yes. It has a rubber cover that slips over the unit. Yes... it has a rubber cap that covers the sight. Yes, a fitted flexible rubber cover! 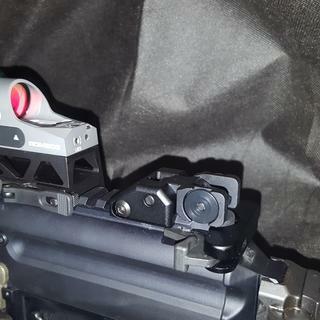 would Daniel Defense fixed iron sights work to co-witness with this? BEST ANSWER: Yes, it should. I put pictures in my review below. 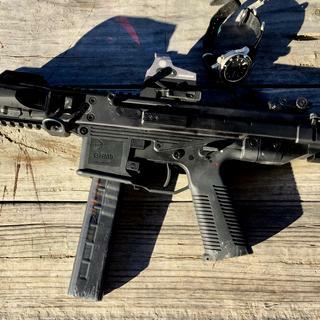 Picture is on a Sig MPX, but flip up sights should be standard. I measured (caliper) top of front post to center-line of barrel at 2.92 inches. BEST ANSWER: I would call Sig to see where it is actually put together vs. actually manufactured. BEST ANSWER: Yes it comes with a rubber cover, the sight overall is a nice piece! 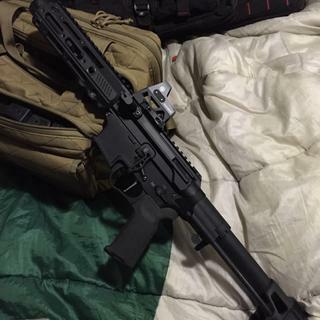 I put it on my MPX and it’s like they were made for each other. Yes, the Romeo 3 does come with a cover. I have this sight on my Ruger PC9. It is a super sight. Yes it comes with a little rubbery form fitting coverEnter an answer to this question. Yes, it comes with rubber slipcover to protect it when it is not in use. Yes, it comes with a rubber cap that covers the housing. Yes, mine came with a nice slip-on rubbery cover. Yes, mine came with a rubber protective cover. Yes, it comes with a protective rubber cover. Yes mine did come with a rubber cover. It comes with a little rubber cover. Can I detach the high rise mount from the Romeo? BEST ANSWER: Yes. I bought three Romeo 3's. Two I used the high rise mount on AR-15s. The third I ordered a low mount on line and removed the high rise mount. You can change the mounts out. Technically Yes, but need an adapter to place it. Another unrised base. I cannot do this with any tool I own. I have many tools. Yes. It’s a normal screw on base. Does it come with the low mount as well? BEST ANSWER: No. The mount pictured is how it comes. Great sight too! Works great on a flat top AR. No it does not come with the low mount on this model. It's this red dot tough enough for a Mossberg 590 a1 recoil ? How long is battery life? Does it have any night vision settings. BEST ANSWER: Battery is about a week on the medium setting,night vision cost more than 250$ so no. Sig P320 Compactc. Can this be used on a P320 compact with no rail on slide? BEST ANSWER: If you are planning on using this for USPSA carry optics division or range use it is possible by removing the standard optic mount, the rear sight on the gun and using a dovetail optic mount like egw or some other manufacturers make. Be aware you would no longer have a rear sight going this route, and I wouldn’t personally do that for carry. Size wise this optic is a bit on the too large size for slide mounting in my personal opinion. I am running one frame mounted on an open race gun and it’s ideal for that or for Tactical rifle use. I don’t know if it could be milled into the slide or not and be able to keep a rear sight for cowitnessing, but the optic is noticeably longer front to back than the vortex razor and Cmore RTS2 which it shares the same footprint style with and which would already be considered on the large size for slide mounting. Hope that helps. 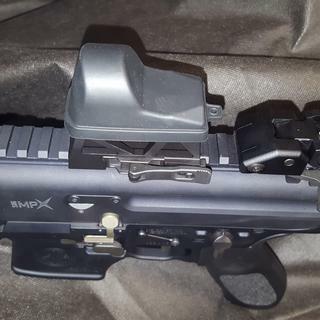 will this mount to a gen 4 glock accessory rail? love sieg sawyer! BEST ANSWER: An accessory rail is what is underneath the barrel and you would not be able to see the sight. I think what you mean to say is "Will it mount to a slide that has an RMR cut?" which is where the rear sight would normally be found. If that is the case, then no it will not fit unless you find a different mount system. also you would have to unscrew this sight from the base because it is too large. 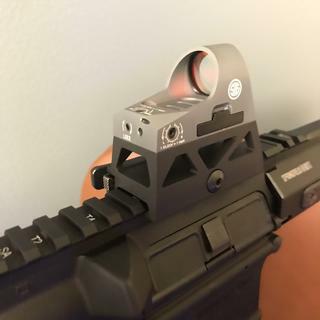 This system is designed for AR or AK with the rail on top or any other rifle based platform that accepts this type of mount. Like the CZ Scorpion. Does it have a hard off switch to prevent vibration/motion from activating the MOTAC while it's in the truck? Does this come with the low mount? I love this product so much I turned around and bought another one. Easy to install and worth every penny. 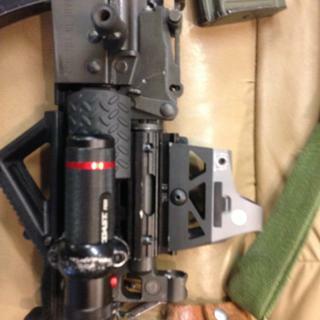 Great red dot sight, especially for the Sig MPX. Perfect function and height. Very good value! Great price, love the auto on. Sleek and sturdy. Bright reticle. Overall good feel. Unexpected quality from a discount optic. I was looking for an open red dot sight. For whatever reason I thought I’d try the Romeo3. The price was right so I went for it. 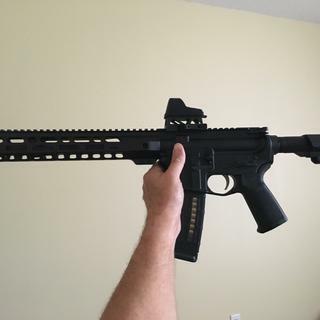 I put it on a AR-9 pistol. Honestly didn’t expect much from it but, when I opened the package, the sight and mount were really solidly built. The finish was really good. The big surprise was the clarity of the glass and the dot. I have a slight astigmatism and the dot was sharp and round. The sight zeroed quickly and has stayed zeroed thru approx 500 rds of assorted 9mm from 115 ball and HPs to 147 gr. I leave it on when I carry it with me and battery life has been really good. Basically I would have expected to pay double for this red dot. I was so impressed with the Romeo3 that I sold my rmr and bought a second one for my truck gun. 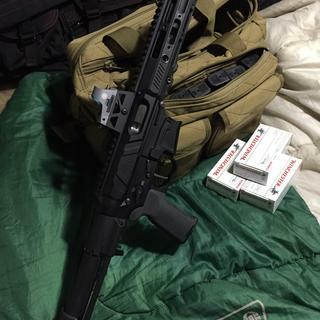 Impressive piece, SIG makes decent equipment. Improved my speed acquiring targets. This a fantastic red dot sight. Something different and the mount is the business! This is an unqualified review as I have not fully "torture tested" this sight for reliability, but from what I've seen, it's a pretty decent sight. On the plus side, it gives a very clear, unobstructed field-of-view, and a nice, bright (adjustable) dot. 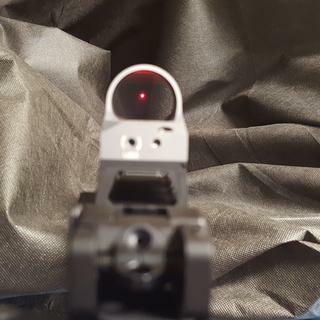 Some Red Dot sights are like looking through a paper-towel-tube, but this one keeps the field of view pretty unobstructed, which I like a lot. And it's very light weight, which is also a big plus for anyone who wants to keep their system as light as possible. On the down-side, it did not come even remotely zeroed from the factory. But if you run it in-between already zeroed Iron Sights, which I say you should, then it's a ~5 minute job to get it on target. Again, I don't know how it will hold up over time, but so far I like it. And for the price, I would recommend picking one up. In fact, I might just pick up a second one! These sights are awesome. Lots of different brightness settings, easy side battery slot, long life and of course the motion detection ON switch. What else do you need in a red dot sight? Took a beating and keeps on pointing! Placed on my B&T GHM9 which took a fall with me. Fall was hard enough to scratch up my watche’s sapphire crystal and knock off the WML. Stayed intact and kept zero. Very happy with this. Great price for a great product. It's made in Japan, not China if that matters to anyone. I found the quality to be very good. The quick detach that is supposed to be lock it inplace comes loose after a few rounds. Even when manually pushing the lock all the way back after flipping the qd lever over it still works its way loose and falls of the gun. I cannot get it any tighter on the rail. The locking grub screw for the windage and elevation only locks the windage on mine as well. This entire red dot and mount are useless. I am trying to get my money back from SIG atm, but they don't seem to care. I will never buy another sig product. 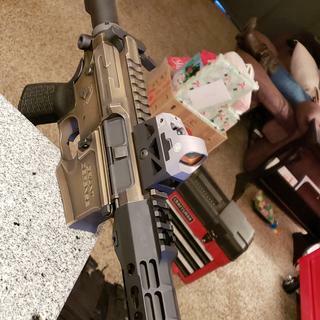 I have other glass, and optics by them that work great, but SIG's "customer service" has convinced me to never do business with them again, as they do not stand behind their products. Awesome fast target acquisition optic. Very clear, lightweight and high quality. I would buy another one. I do like the dial in the Aimpoint rather than the arrows, but this one is tolerable given all the other nice features. I especially love the instant on feature. Changing the battery is a little tough, but not that big of deal. 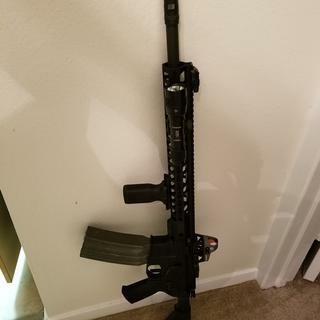 I have very high expectations and only buy premium products and am very happy with this on my 10.5” AR. Highly recommended! Very nice, will not disappoint. Strapped this bad boy on my 300 blk pistol. Started hammering targets with very little calibration. It also seems to be holding zero very nicely. it one of favorite sights. it only works on my rifle I want see if I can get adapter so i can use it on my sig. pistol also . It one of my favorite site uses on all my rifle .Need adapter to working with my sig pistol. Thank you for commenting on the SIG Sauer Romeo3. Palmetto State Armory carries a variety of optic plates to fit most SIG pistols. 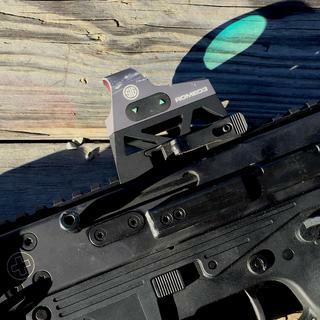 You will need to remove the QD Mount and mount the Romeo3 optic directly to the baseplate after it is installed on the handgun. After I went to hardware store to purchase screws to attach sight to riser (none supplied), I found sight quick and easy to aquire targets. Quality control issue. 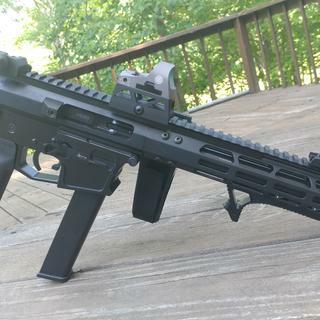 Sig failed to pack the screws needed to attach the red dot to the mount. I am a Sig fan, and like the Romeo 3, but unfortunately Sig failed to include the screws necessary to attach the red dot to the riser. The red dot cannot be attached to any firearm in the condition it was received. I contacted PSA, but they directed me to SIg. 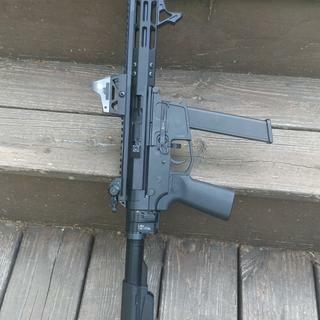 I then contacted Sig who advised they would mail me the missing hardware, but over three weeks have passed and I still haven’t received the necessary parts. Without the screws, the red dot is useless. 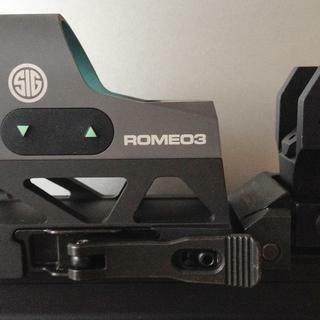 I have several romeos, however I prefer the 3 for AR pistols. Great reflex site, would prefer not to have the two-tone, but I can deal with it. Broke first time out. Sig has lost a step or two on their QD mounts. 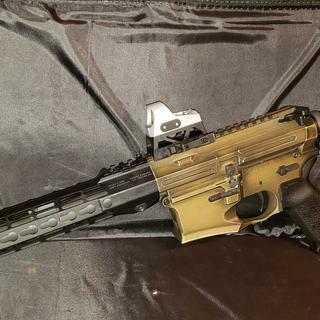 Put this on an AR9 and within 5 rounds it crumbled like a sandcastle. Would not recommend to anyone. 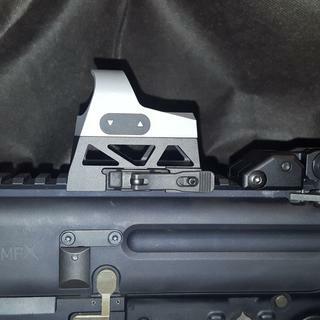 I bought the first Romeo 3 sight to mount on the top fore rail of an AK Pistol. I was very pleased with the sight and the ease and location of the control buttons. The optic is very quick on target and I like the two night vision settings. 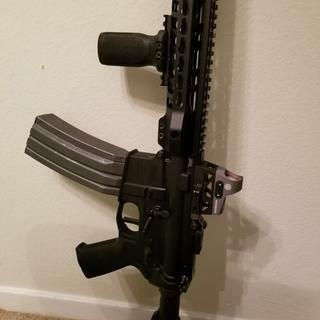 I liked it so much I bought two more, one of which I mounted on an AK and the other I plan to mount on an AR pistol I am currently building. The sight comes with a high mount only which is designed to co-witness with AR sights. 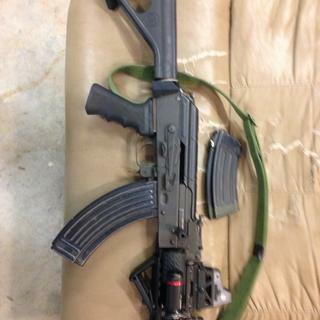 For the AK application I had to purchase an additional low mount. I checked the price from a major on-line retailer which usually has the lowest prices and they wanted $400 for the same sight but I think that included both high and low mounts. Great sight, great price, consider your mounting requirements. I mounted this on a CZ scorpion pistol. Very nice. Great red dot, I wish the red dot was a little bigger. Used optic sold as new. Mine arrived in a plastic bag. New Sig optics come in grey boxes with a silver tamper seal. It has nicks all over the mount and is obviously used or a refurb. Palmetto will not issue me a refund like every other retailer like Primary Arms or Midway would do in this situation. They're declaring it a "manufacturer's defect" and referred me to Sig. 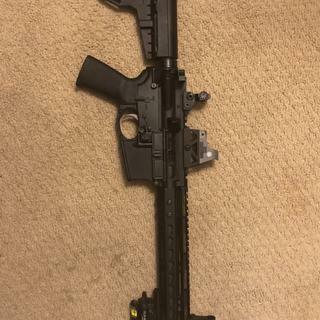 Palmetto advertised it and sold me the optic. Palmetto should be the ones to take this up with Sig. I'm very upset with their customer service. Very deceiving and misleading. We apologize that you had this issue. We received those products from SIG in the condition you received your product. As per our terms and conditions, "If a defect in an optic is discovered by the customer, the customer must contact the manufacturer directly for replacement or repair." Love it more than my 512 Eotech. Sig makes a strong argument here. This is now my favorite optic because this reflex gives you a TON of eye relief. Very comfortable to use, and surprised by Sig's quality here.The optic normally costs 350-400, so great deal too. I wouldn't say it's built like a tank, that's what the Eotech is. Nimble, lightweight, and hyper fast is how I'd describe the Romeo3. 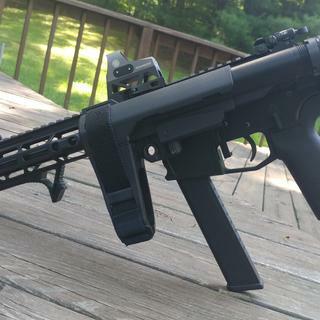 This optic is awesome and goes so well with my MPX! The quality and the price make this a no brainer! Well designed, well made, would buy again. Reliable, retains zero. 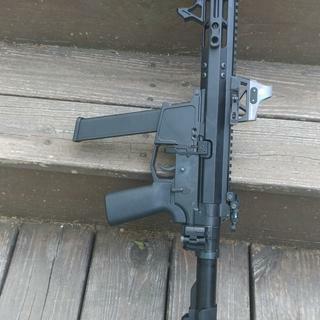 I put it on an MP5 clone with a rail. The see through high rise mount allows unobstructed use of the iron sights without putting the optic too high off of the receiver. I use this on my USPSA/IPSC open gun and this dot can take a beating and is a very clear dot with very little staring. Works as advertised. Has been holding zero (25 yards tested). Co-Witnesses with standard flip up sights. Auto-shutoff works (tested in safe, checked off then tapped and auto-on). Will update if anything happens negative and will report on battery life after 6mo to 1 yr. I purchased as clearance and think it is an excellent value for the money. Light weight, great FOV, crisp dot and solid mount. Absolutely satisfied with my Sig Romeo 3. I've put it on my Ruger PC9. I couldn't be happier with the quality, price and performance of the sight. I originally bought a few of the more "well known" and expensive red dot optics for my rifles. They work, but are a bit larger than I wanted on a new build so I got a Romeo 5. 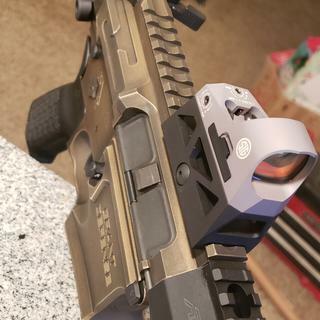 I was so impressed with that Romeo 5 that I replaced all my more expensive optics with the Sig optics - and then when this one went on sale I decided to pick up a Romeo 3 for a CZ Scorpion build. Once again, Sig does not disappoint. I always felt that other brands that cost $600 or more per optic were a bit overpriced, and now that I have had time with the Sig line of optics I can say there is zero reason to pay that much for an optic. I can remember the days not that long ago, when the only optics by Sig, were cheap, rebranded, pieces of crap. This is not that by any stretch. Very solidly built, more so than the Vortex competitors, easy to use, easy to swap batteries (Doesn't have to be removed) and I've removed it several times, and the mount actually held zero. Can't ask for more than that at $250. 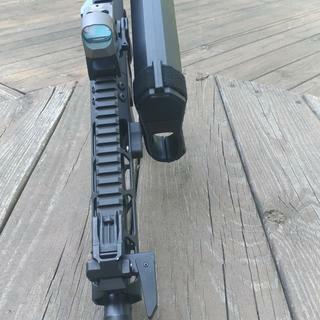 I used this sight on an AR-9 build. It was easy to adjust following the instructions to have point of aim dialed in for point of impact. Great price on this quality red dot sight. 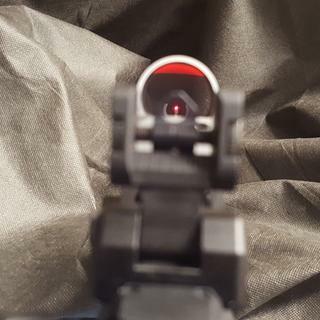 I use this sight on an AR9 and I absolutely love it, quick target acquisition and easy to sight in. Great red dot! Sig always makes quality optics. Was already assembled on the mount just needed to be tightened down. One downside is the itty bitty Allen wrench for adjusting windage and elevation. Very small and might lose it. Great sight. The motion activation is really nice. Very clear glass. Looks great on my virtus pistol. Even better with the half off sale. 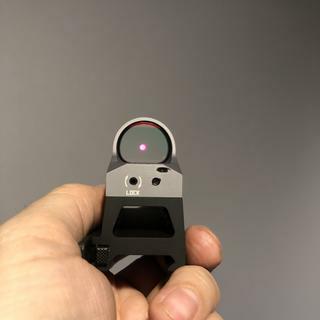 Impressive well built red dot at a fantastic clearance price from PSA. I’ve seen some questions on various forums concerning Sig optics namely country of manufacture. The optic delivered from PSA was clearly marked “Made in Japan”. For me this is much better than sourced from China as Japan is a close US ally and known for quality glass and electronics. This unit does not come with the mounting bolts to attach the red dot to the QD mount. You will need two M4-0.7 X 12 hex head bolts readily available at the big box hardware stores. I was so impressed with SIG ROMEO 3, at first I thought it was just a reflex sight but I know now it's the right sight for my 10.5 CHF 556. Will post some post shooting experience..
PSA You got me a great deal..